One of our daughters has been suffering from intestinal problems for a couple of years. She suspects that it's linked to gluten. So that and my steadily increasing weight gain inspired me to read The Wheat Belly. Even though I don't agree with everything he says, I've decided that restricting wheat, grains and sugar from our diet is worthy of an attempt. Here are some in depth reviews of Wheat Belly; 1, 2, 3, 4, which outline the pros and cons of Davis's weight loss premise. 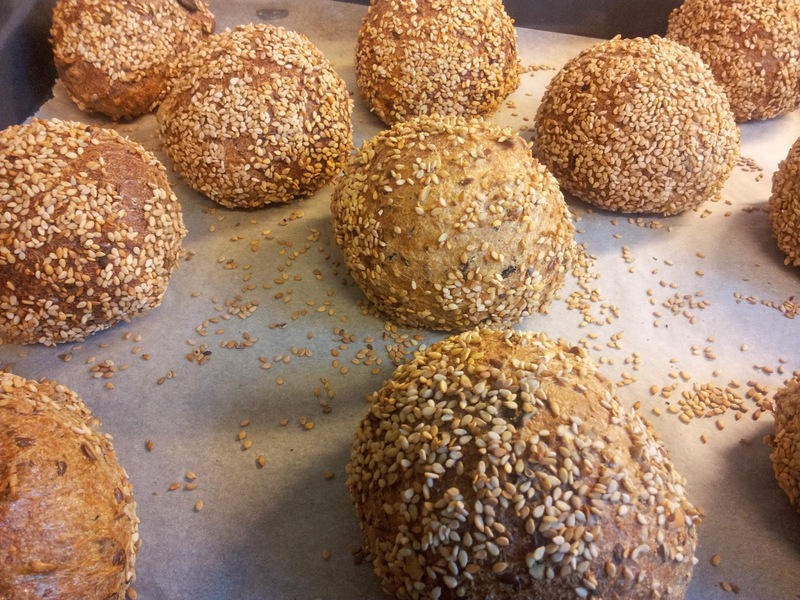 In the last few weeks I've tried several gluten and grain free bread recipes. After many so-lah-lah attempts from recipe books and web sites, I decided to convert one of my favorite recipes (it's the Five Seed Bread in the Aussie Everyday Cooking.... for every family book) to a grain free bread. And after a few trial and error masterpieces, I've come up with a recipe that works. The amount of liquid may vary slightly depending on the type of coconut flour you use. 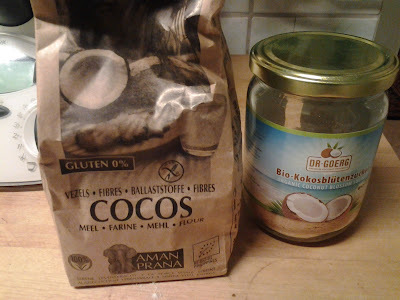 I found my coconut flour, coconut milk, coconut oil and coconut sugar in Alnatura in Weil am Rhein, Germany. If you're in Kanton Aargau, you'll find the psyllium seed husks at Bio-Peter in Lenzburg. The recipe below makes 3 to 4 small'ish loaves, I usually freeze 2. The crumb of this bread is perfect for sandwiches and it also toasts well. 400 g water or coconut water/milk or almond milk. / After lots of experimenting I prefer to use water, it makes the bread lighter. Grind the Psyllium seed husks for 1 min, speed 10. Mix on speed 6, 10 sec. Add the liquid ingredients, work as quickly as possible here. Mix for 15 sec on speed 7. 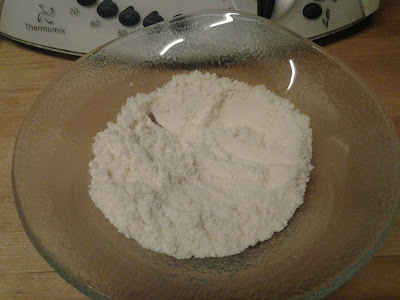 Add more water if necessary, the dough should not be too dense and dry, the amount of liquid needed does depend on the brand or type of coconut flour being used. Place on a paper lined tray and bake in the oven for 30 to 35 minutes (depending on the size of the loaves). Allow to cool completely on a wire rack before cutting. 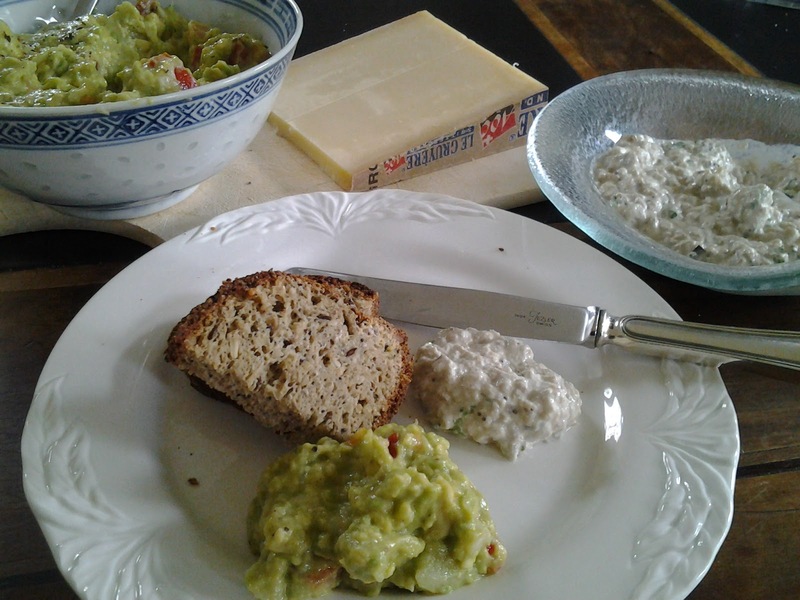 This was day 4, toasted and served with guacamole and baba ganoush. This is how the bread looks if you double the amount of baking powder (see changes to the original recipe in red above). I also omitted the poppy seeds, and increased the other seeds. hi interested in buying a thermomix living in Savoie. Hi Fiona, are you living in Switzerland? My email address is cheryl.devalliere@gmail.com and my phone no is +4178 853 8956. Please contact me if you're still interested in buying a Thermomix. Note, only the new TM5 model is available now, price is 1395.- SFr. Hi Gillian, not sure what to suggest.... perhaps it's your baking powder? You could try to use 1.5 tsp bicarb and 3 tsp cream of tartar instead of your normal baking powder. And mix into the dry ingredients VERY well, or add them separately to your liquid. 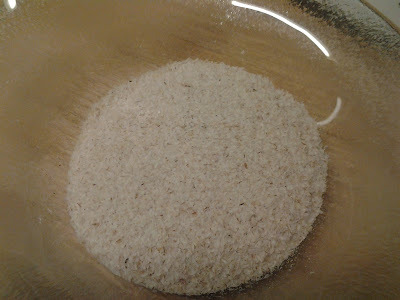 I've made all sorts of variations with this recipe, e.g., Teff flour with yeast (10 g fresh yeast or 1 pkt dry yeast, and reduce the amount of Psyllium seed husks, almond meal and tapioca flour also works. I only use yeast when I make this bread with spelt flour, so if you're gluten intolerant or you're avoiding grains you shouldn't try this. Thanks very much for your suggestions. I will try the bicarb/cream of tartar instead and see if that helps. I haven't heard of teff before - I will look out for it. I do have another grain-free bread recipe that uses yeast but that is predominately based on buckwheat and quinoa flour, which I guess behaves a bit more like wheat flour than the seed grinds might do. Yours has a much nicer flavour than the other one. I can report that the yeast made no difference at all. I used 3tsp of active dry yeast and used warm water instead of cold and left the dough for an hour or so in the lounge, which was the warmest spot on a late winter's day in NZ! It didn't rise at all and the texture was just as dense. So I could have got the process wrong, or perhaps these ingredients just don't go with yeast. I'm going to try the bicarb/cream of tartar today. Did the cream of tartar and bicarb work? Hi again. No, it didn't make any noticeable difference. However, I am now using ready ground linseed and chia seed, which makes my mix a finer texture and that seems to have helped a bit. I find that the rolls rise nicely in the oven and then collapse quite a bit while cooling. I will keep experimenting! Hi Gillian, I think it could be that you added a little bit too much bicarb and possibly that the mixture might be a bit too wet. That happened to me once too. Thanks for keeping me up-dated! Hi there, am on a similar journey after finding out that due to my mothers fatty liver disease and my dads type two diabetes my whole love affair with carbs has to be ended. would love more recipes and ideas as am finding it tricky. have just found out that our local restaurant is closing down as the owner/chef is really ill with an unnamed bowl/intestinal problem, things are just getting harder and harder! thanks by the way for the bread and the carrot cake recipes, too delicious. make sure the psyllium and flax are ground very fine. Then I make 2 loaves and bake at 175 celcius for 1 hr 5 min and let it cool for 30-60 min before cutting into it. Makes a less dense lighter loaf of bread. I have actually found that doing it without a thermomix makes a dense bread. I have a lot friends who have tried this and just cant get it right. I think something about the mixing process when the wet and dry are mixed. I have mixed for a short time and it was too tense but if i mix on a high speed for atleast a minute it works good. I use this bread for my daughters waldorf playgroup where the children make bread for morning tea, it has been a life saver. Thanks so much for this recipe. It is the best bread recipe I have tried since following the Paleo lifestyle for the last 18 months. This is the second time I have made the recipe and had success each time. I did find out today that doubling the recipe is too dense for the Thermomix to cope with. However I just separated the mixture into two before kneading and it worked well. I got two good sized loaves. Last time I made some rolls and a small loaf which froze well. After thawing and cutting it lasted a good week wrapped in foil in an airtight container in the fridge and was still moist and fresh. Thanks again. This recipe is sooooooooo good! Thank you!!! Lovely lady, I'm not sure if you still check this. But I have used this fabulous recipe of yours for ages, then found through a friend it is on a thermomix community site. Your recipe, not you as the author. Wanted to give you full credit if you are interested in following it up. This is a unique and awesome recipe you created. Thanks so much for the recipe - a lot of Thermomix owners make this recipe in NZ! I came across it after trying some at a food show recently. I made some rolls yesterday (I have a Thermomix). The texture was so good, great crust and soft inside. 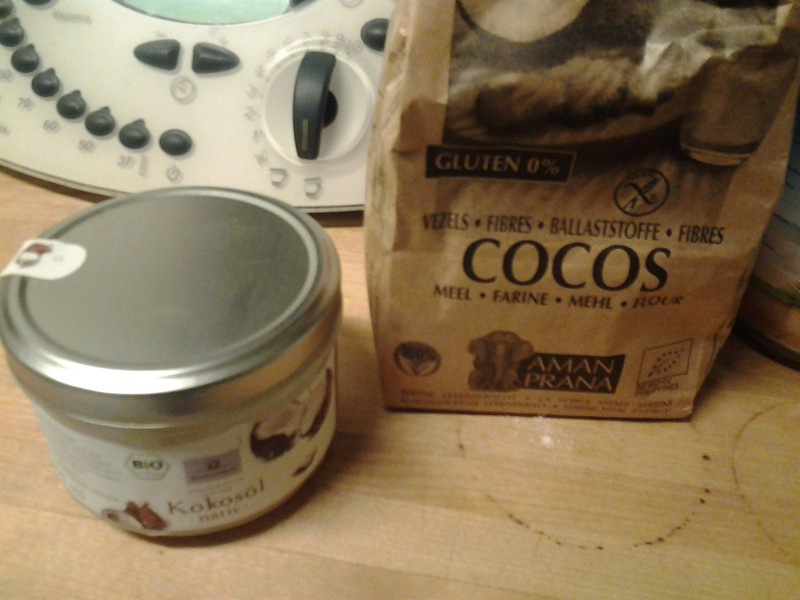 and wondered have you ever tried replacing the coconut flour with another GF flour? Thought I would give it a try next time. Wish I could attach a photo - as the rolls look amazing!